Well okay, in principle it wasn't the worst idea - I'd prefer Muse do this than try to make reggae or hip-hop or bluegrass - but I've seen this sort of 80s pop pivot a lot in the 2010s and Muse aiming to capitalize on nostalgia this blatantly seemed like a weird move, especially as their experimental tendencies tend to push them in very different directions. Say what you will about the mess of The 2nd Law with its warping dubstep touches or the grinding sludge of Drones, at least they felt contemporary and moves that made credible sense coming from Muse, even if neither worked in their entirety. Going for 80s synthesizers and softening their edge even further for a retro pastiche... look, Muse is too weird and earnest to consider something like this a cash grab, but as someone who has always been hit-and-miss on this band, I was concerned this could get ugly, especially given the polarized critical response I've seen. And my feelings weren't assuaged by the production team: Shellback, Timbaland and Mike Elizondo, are they making an 80s pop rock project or something that would drop in the late 2000s? But fine, what did we get out of Simulation Theory? You know, I can't believe I'm going to be the one saying this... but I don't hate this album by any stretch. 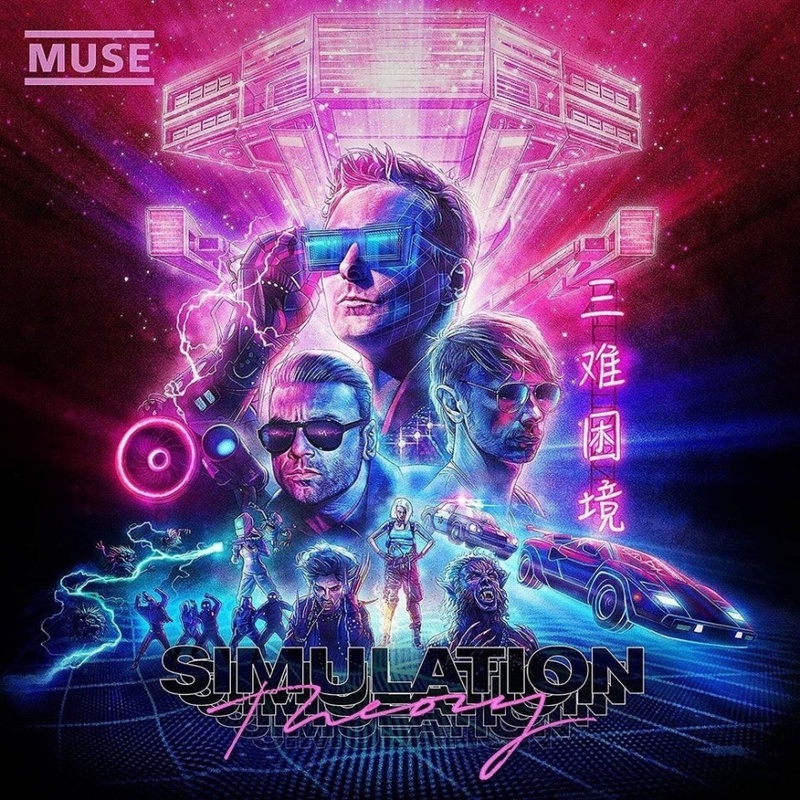 I'm serious, I was expecting this to be a catastrophe, a gigantic untenable mess because Muse does not succeed or fail in moderation, but going through Simulation Theory multiple times, while it is a total mess, I don't think it's terrible. Part of this was understanding the sonic roots of this project and being able to draw a parallel to songs and tones that worked, at least for me, and once I got that, I didn't find this album nearly as incomprehensible as I feel some have branded it. That said, even if I can find some things to be positive about, I won't say this is particularly good - just because I get it doesn't mean I always like it, and really, a lot of its problems are issues I've had with Muse for years, just all the more evident now with a straightforward retro-pop rock gloss. So let's start with that production, because for as much as critics and even Muse themselves have played up the synthpop elements, I'd argue the sonic palette is actually a lot broader. Yeah, you get the thick, buzzing Casio keyboards and programmed drums and weird, spiky bass, but that was not unique to just acts in 80s pop rock - hell, on a few cuts especially with Matt Bellamy's falsetto, it's pretty easy to see parallels with Prince, and the wonky acoustic tuning and genre-bending actually reminded me a fair bit of Beck as well. And when you combine them with the modern trap influences on mainstream pop, the clearest 2018 parallel snapped into view: Man Of The Woods by Justin TImberlake, an album that paradoxically gets better and worse every time I hear chunks of it. But it's here: the wonky synth choices and attempts at grandiose funk that are significantly stiffer than they should be, the warping pileup of genres, the falsetto, the grinding rock and distorted electronics that feel bafflingly out of place especially opposite the rest of the instrumentation. And yes, it's messy and awkwardly structured and seemingly designed to alienate Muse fans who are looking for progressive rock and have forgotten that Muse always makes weird mainstream pivots - and I think there's an uncomfortable amount of truth in that last point, because like with Justin Timberlake, if you had given some of these songs to other acts, I'd think they'd get more praise. Granted, it's a little less true with Muse because of their brand of composition, and this is where we hit a major roadblock that's been true of the majority of Muse albums: structure. I've always been of the opinion that for as weird as Muse can be, they've got some great compositional ideas and phrases, and they strike gold in two distinct ways: refining them down into their most streamlined and ruthless form - think 'Madness' or 'Uprising' - or blowing them into hysterical extremes, see your 'Knights Of Cydonia'. When Muse falls into the middle ground, you run into songs that have melodic ideas with little connective tissue or foundation to really drive them home - and when you're making more pop-centric tracks, that structure becomes all the more important, especially when you can't distract with production gimmicks in the same way. Now granted, considering how damn cluttered so many of these mixes are, Muse is trying to deflect in some way - look at 'The Dark Side', one of the better songs here if only for maintaining some guitar foundation, but it loses focus with the whooshing change-ups, strings embellishments, and added synthetic layers over everything, including the vocals, which you'd think you'd want to give some greater focus given Bellamy's timbre is one of the band's most consistent strengths. And yet it keeps happened: the weird blocky horn pickup and wonky vocal mix on 'Pressure' that don't compliment the noisy guitar lead against the sleigh bell, how much gurgling synth and sparking fuzz is dropped onto the primarily acoustic groove of 'Something Human' which probably owes more to George Michael's 'Faith' than anything, and then there's 'Get Up And Fight', which tries for overblown empowerment anthem with uncredited vocals from Tove Lo and a pretty decent groove on the verses that becomes an overcompressed disaster on the hook. And then we get the songs that flew entirely off the rails, with 'Propaganda' being the first and most obvious with the stuttered synthetic vocal, tinny trap skitter, and weird attempt at blaring funk, none of which fits with the off-kilter acoustic interlude and how the song never takes off properly. And then we have the farting industrial touches and theremin of 'Break It To Me' that seems half pulled from Nine Inch Nails' 'Closer', followed not soon after by the overblown trap knock of 'Thought Contagion' that might have some of the worst tonal balance between synth fidelities on hooks and verses Muse has ever delivered - hell, they even try to bring back their brand of dubstep on 'Dig Down' complete with overdubbed choral vocals and a blocky bass knock, somehow giving the guitars an incredibly weedy tone. Hell, even though 'Algorithm' takes too long to get going and 'The Void' never properly takes off the way it should and 'Blockades' has those weird borderline-breakbeats and is cribbing way too much from 'Uprising', the pulsating blend of strings, buzzy synths, and grinding spikes of guitar at least manages to hold a stable melodic progression. Of course, some of this could have been redeemed if the lyrics mattered... and I'm not sure I can complete that sentiment with a straight face. Look, if there's one thing I'm grateful about coming from Simulation Theory, it's exposing a theory I've had about Muse for years: they might have grandiose ideas and concepts, but there's little if no follow-through beyond that. And while the grand language of albums before The 2nd Law might have slightly disguised it and Drones might have deflected through its overheated attempts at political subtext, Simulation Theory is refreshingly straightforward, almost single-minded, as damn near every single song has the exact same theme and subtext of breaking free of a dark, oppressive system. Sometimes our protagonist can do it himself, sometimes he needs help, sometimes he's helping someone else, sometimes he needs a shot of information and truth to get there to break through mental blockades, but the arc is damn near identical from song after song... and man, that drains so much flair from the album. Look, it's rare anyone comes to Muse for the lyrics anyway, but for an album that's trying so hard to experiment in its sound, for the writing to feel so pedestrian, even for modern pop rock... look, I'm not surprised, but I sure as hell am disappointed. But - and I can't believe I'm saying this - the by-the-numbers writing does avoid the pitfalls of the outright bad or misinformed writing of Drones, which means I wind up finding myself feeling charitable towards Simulation Theory. Despite the mess of it all - and make no mistake, this project is a mess - there's enough solid melodies and tones I like to save it from being outright bad... but at the same time, given how sloppily it's all assembled, it's hard to avoid the feeling that there's a striking amount of waste here. Imagine if Muse had used these tones to take their broad anti-authority subtext in a more concept-driven direction, or had assembled these songs with any clear coherence... and with that in mind, I'm giving this a strong 5/10 and really just a recommendation to the diehard fans. For everyone else... well, at least it's not overlong, so if you're curious, it's worth a listen, but don't say I didn't warn you.